Facebook Offers is a feature of Facebook that allows businesses to post an offer, such as a restaurant or store discount, on their Facebook page. Both Facebook Page admins and editors can create offers. There are two kids of Facebook Offers that a Page can set up, promo codes can be used, and a business must pay a fee to promote them (but they're free to post). In Store Only: These offers are good in-store only. To be redeemed, customers present the offer either in print (from an email) or by displaying it on their smartphone. Online Only: This offer can be redeemed online only, through the company’s website or some other online platform. In Store & Online: You can choose both the Facebook Offers options so that they can be redeemed by customers both online and in a store’s brick and mortar location. From the left side of your Page, choose Offers. Click the Create Offer button. Fill out the details for the offer like an explanation about it, when it expires, any photos you want to show about the offer (like barcodes, etc. ), where it's available (in-store, online, or both), a promo code, and any terms and conditions that apply to the offer. If you're offering an online deal, you have to provide the URL for where people can take full advantage of the offer. Click Publish when you're ready to give out your Facebook offer. Choose Offers from the left side of Facebook. If there's a promo code, you can copy it, else visit the offer's website for more information, like to print the offer or to checkout online. You can limit the number of users for your offer through the Total Offers Available field when you create the offer. 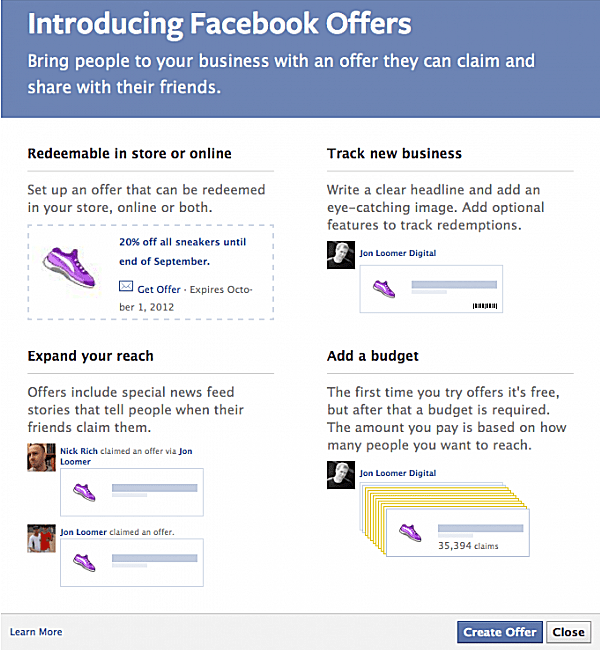 Facebook Offers are only available to be posted by Facebook Pages, not individuals profiles. In order for a page to be eligible to create an offer, they must have 400 or more likes. For in-store offers, if the user has their location enabled for Facebook to use, and they've saved the active offer, they'll be notified when they are within the vicinity of the store. Make discounts substantial. If your offer is for a discount, make it for at least 20% off of the regular price. According to Facebook, offering items for free of charge in addition to a purchase typically performs better than discounts. Keep it simple. Make sure you define and explain your terms and conditions as simply as you can. Also, avoid any unnecessary steps for customers. Use a clear and engaging image. When you are choosing a photo, keep in mind those presenting someone using your product or service will have more benefit than a photo of the item alone. Also, take note that your Page's profile picture will also be shown next to your offer in most places, so be sure you do not use the same photo for both. Keep language natural and direct. Make sure your headline is attention-grabbing, but also do not add any extra confusion. Your headline should feature the value of your company’s offer rather than a slogan without any substance. Set a reasonable expiration date. Time is important. Make sure you leave enough time for your customers to see and claim your offer. This is a great way to engage in word-of-mouth marketing as well; leave time for customers to talk and post about your offer. Promote your offer. A great way to promote your offer is by pinning it to the top of your page. Facebook recommends that you re-share existing offers rather than creating new ones, in order for you to easily track its reach. Train your staff. Make sure your staff understands the terms of your offer and how customers are able to redeem it. Use a photo. The best option is to use a photo of your product or people using your product or service. You can't edit an offer after you post it. If you have any other questions about Facebook Offers or making ads for them, visit Facebook's help pages on Offer Ads and their Creating Offers help page.